Hog Roast Kirkham were delighted to be recently asked by Kerry from Inspired Energy to cater for 200 guests at their Summer Party at Kirkham and Wesham Cricket Club. The organisation is a local employer and is a utilities and energy provider and this event was to promote the company and staff and celebrate its success with a summer event for staff, clients and the general public alike. It was clear that an event of this nature would likely be very busy but relaxed and we discussed which menu was most appropriate and with six to choose from for this type of event, the client wanted a more formal buffet service with our traditional hog, new potatoes, coleslaw and mixed salad. Hog Roast Kirkham has catered for many corporate events and clients have been so impressed with our quality of food and service that we have received repeat business from them and with very positive feedback; it is essential for any catering company to ensure that the high quality is sustained and consistent as there are many good catering organisations out there, we like to think that what makes Hog Roast Kirkham stand out and be great, is the consistently excellent food and service that we provide. We regularly cater for organisations and other corporate events as well as weddings and private parties and we have created a very wide selection of menus to cater for different requirements ranging from Our Firm Favourite Classic Slow Roasted Hog in a Roll or Wrap suitable for stand-up informal gatherings through to formal events that requires sit-down service. We liaised closely with the organisers and we arrived in plenty of time to set up our equipment, carefully managing the loading and access points. As soon as the pig started to roast and the fabulous aromas from the pig started wafting around, plenty of people came over to investigate and, with mouths already watering, were looking forward to the delicious food that we would be serving. 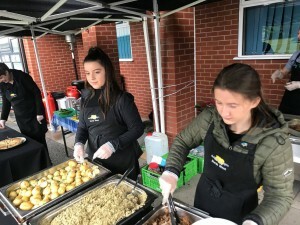 Once serving commenced at 4pm, the buffet food was quickly devoured with many coming back for more and with very positive comments about the professional service and high-quality food that we served; Hog Roast Kirkham hope to be back next year!